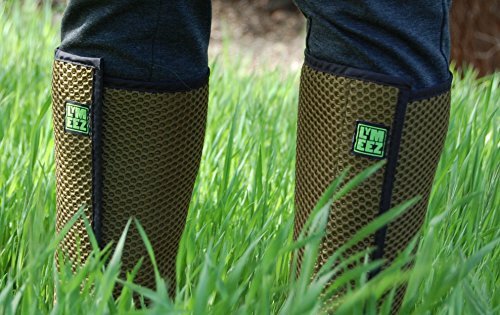 Lymeez 3D Air Mesh Tick Gaiters. 12” wrap. TREATED (Permethrin). 3D mesh slows ticks = longer exposure to repellent. Durable. Long-lasting. Cost effective. On/off wrap. Adjustable fit. HOW TO WEAR: (1) Remove green/black hook guard between gaiters. Save for washing or storing gaiters. (2) Start wrap at ankle below pant cuff. Pull firmly & press hook strip onto 3D mesh fabric. (3) Continue wrapping for snug but comfortable fit. NOTE! THE GRAB OF THE HOOK STRIP TO THE 3D MESH QUICKLY GETS STRONGER WITH EACH USE. YOU CAN BREAK THEM IN FASTER BY PUTTING THEM ON/OFF A DOZEN OR SO TIMES. LYMEEZ 3D AIR MESH TECHNOLOGY CONFOUNDS TICKS. Tested to slow ticks climb by 4-8X than common pant fabrics. A slowed climb means longer exposure to repellent. TICKS DON'T FLY OR JUMP! 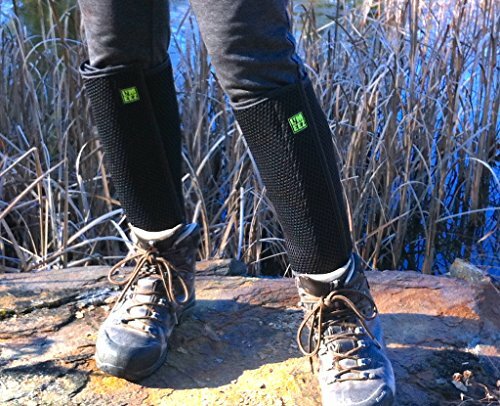 Lymeez 3D Mesh gaiters, at 12" cover the lower leg, the common ambush height of ticks. ACTIVE RELEASE. Millions of microcapsules of permethrin repellent are bound to fibers throughout the product, gradually released by the friction of walking. CDC: "Products containing permethrin kill ticks." Repellency lasts through the expected life of the product. Also repels mosquitoes, fleas, chiggers and other mites. SEWN AND TREATED IN THE USA. Lightweight. Easy on/off wrap. Breathable. Comfortable. Durable. Adjustable fit. Tear resistant. One size fits adult calf up to 18" circumference. 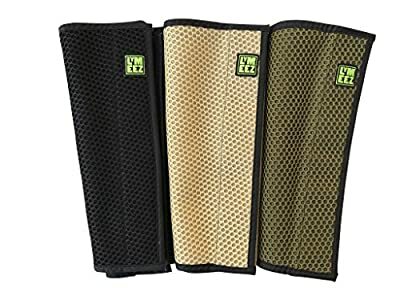 Perfect for Working Outdoors, Hiking, Walking, Gardening, Camping, Golfing, Birding, Hunting. Patents pending. PLAY MORE, WORK SAFE, WORRY LESS! Lymeez have been treated with EPA-registered microencapsulated permethrin tick repellent. EPA Reg. No. 86110-2. HOW TO WEAR: (1) Remove the double faced loop strip protector (save for washing or storing your gaiters). (2) The hook strip attaches to the 3D mesh anywhere for best fit for you. (3) NOTE! THE GRAB OF THE HOOK STRIP TO THE 3D MESH QUICKLY GETS STRONGER WITH EACH USE. YOU CAN BREAK THEM IN FASTER BY PUTTING THEM ON/OFF A DOZEN OR SO TIMES. (4) Attach below pant cuff (or bare leg if wearing shorts) then wrap around leg.